Next I sorted all columns by TTM P/E and eliminated every stock with a TTM P/E over 18. 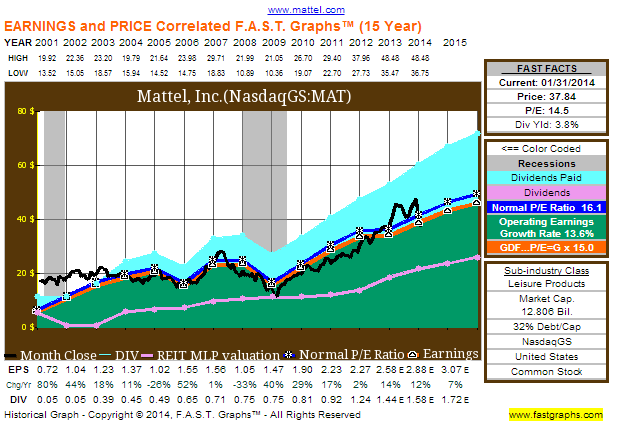 I do realize this eliminates a lot of REIT’s, MLP’s, and telecom stocks. 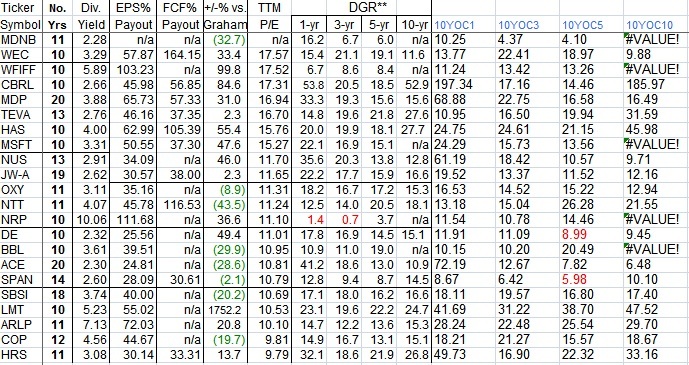 I’m ok with this since I’m not really targeting these stocks right now.Then I decided to eliminate any Champions with a 10-Year CAGR < 5%, followed by any Contenders with a 5-Year CAGR < 7 % and finally any Challengers with a 3-year CAGR < 7%. This screen eliminates slow growing companies like utilities. This last screen dropped the list of Champions, Contenders and Challengers to 16(-1), 51(+20) and 41(0) respectively. This new round of elimination dropped the list sizes for the Champions, Contenders and Challengers to 5(0), 9(+1) and 26 (-3) respectively. On the Champions list, there were no changes from last month. I did leave a couple of energy behemoths, CVX & XOM, since they aren’t far off from making the list. If you noticed, I’ve added a very small amount of FDO into my portfolio and plan to slowly build up to at least a half position over the next 12 months. There was just one new addition to the Contender’s list, AMP. I don’t know much about the company but it may be worth some research. The Challenger’s list dropped by 3. It seems a few of the financial companies changed. I like this list as an additional watch list. I know I posted recently a Watch list of 50 companies that I’m interested in owning at some point if the price is right. It’s more of a static list that I’ll change as I see fit. The thing is that I’m already around my target portfolio size of 40, so the majority of my purchases will be of existing positions. This last screen dropped the list of Champions, Contenders and Challengers to 21(+3), 35(-4) and 35(+4) respectively. After sorting, I looked for any companies that had a 10YOC1, 10YOC3, 10YOC5 or 10YOC10 of 10% or higher. I applied this to the list of Champions, Contenders and Challengers. After applying this rule the lists dropped to 9, 23, and 31 companies respectively. This elimination dropped the list sizes for the Champions, Contenders and Challengers to 6, 11 and 20 respectively. Here are the 37 candidates left that may be worthy to do further research on. Note that I included a few candidates highlighted in red that were close to making it. The list I came up with in January had 33 candidates. It’s not surprising that this number has increased as the markets have gone down, which has caused starting yields to go up. A few new names on the Champions list are WEYS and FDO. I also left AWR on since it barely missed qualification due to P/E. I own TGT and CVX on this list. 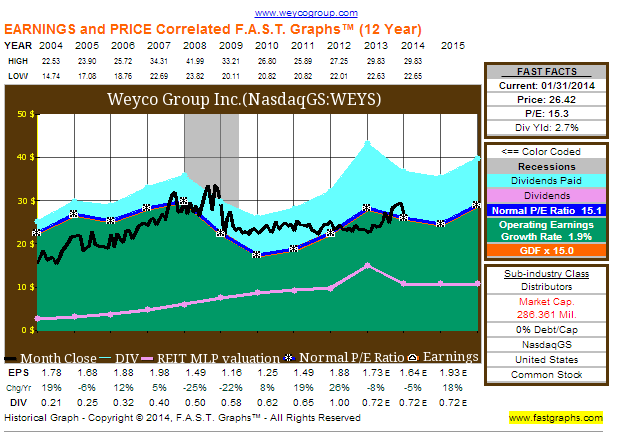 I just recently added to CVX on weakness and have been adding to TGT also to average down my cost basis. 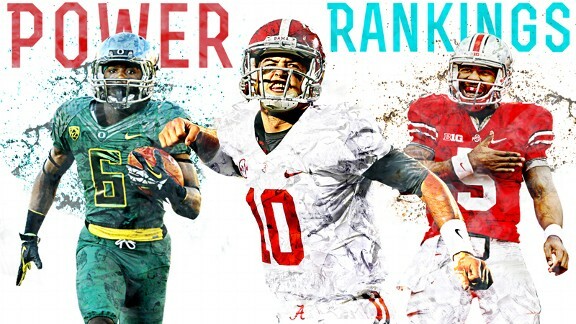 IBM, DE and GIS made the Contenders list. I own DE, GIS and CAT. I’ve been recently adding to DE and want to add to GIS soon. A couple new names on the Challengers list include TUP and MAT. I also left RCI and BCE on since I’m looking to increase my telecom exposure and they didn’t miss by much. On the challengers list I already own TGH and PM. PM was a spinoff from MO and I give them more credit than just being a challenger. I’ve been adding to the position recently to average down. I’m trying to do these each month as long as there’s interest but I was busy and didn’t get to for December. You can find previous months by following my Articles label. This last screen dropped the list of Champions, Contenders and Challengers to 18, 39(+4) and 31(+3) respectively. 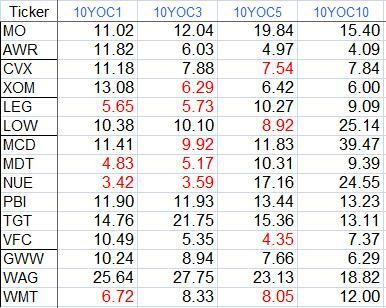 After sorting, I looked for any companies that had a 10YOC1, 10YOC3, 10YOC5 or 10YOC10 of 10% or higher. I applied this to the list of Champions, Contenders and Challengers. After applying this rule the lists dropped to 10, 25, and 27 companies respectively. This elimination dropped the list sizes for the Champions, Contenders and Challengers to 4, 11 and 18 respectively. Here are the 33 candidates left that may be worthy to do further research on. The list I came up with in December had 37 candidates. It’s not surprising that this number has dropped once again as the markets have gone up, which has caused starting yields to go down. A new company, Helmerich & Payne (HP), is on the Champions list. They have increased their dividend for 42 straight years! However, they weren’t previously on my list because of a much lower yield. HP paid out .07 quarterly in 2012 and paid .15, .15, .50, .50 in 2013. They also already declared another increase to .625 payable March 3rd of 2014 with an ex-dividend of Feb 12th. HP is in the business of contract drilling of oil and gas wells both on and offshore. I just recently picked up shares of ESV (mentioned here) which has similar services. However, ESV is all offshore drilling. Instead of adding to ESV I’m considering 1/2 positions in ESV and HP assuming the research I do on HP checks out. I think the companies could compliment each other. COP made the Contenders list. I own COP and it’s at full weight currently but I’d add more if it gets back down to at least 65. On the challengers list I’ve already recently added to PM. Also on the challengers is BAX which I think is at fair value right here. I haven’t considered the company before since I already own both BDX and MDT but I’ll be looking into the company more. BAX does have a higher starting yield which I like. Last month I decided to take the CCC spreadsheet and rank the stocks based on their 10-year YOC. If you are unfamiliar with what Yield-On-Cost is (YOC) then refer to my resources tab or see below for an example. If you don’t know about David Fish’s Champion, Challenger and Contender (CCC) spreadsheet then you are doing yourself a disservice, it can be found here. I’m doing this screen once again and applying it to the Feb. CCC sheet and will compare the results. The original article used the Jan. CCC sheets and can be found here. 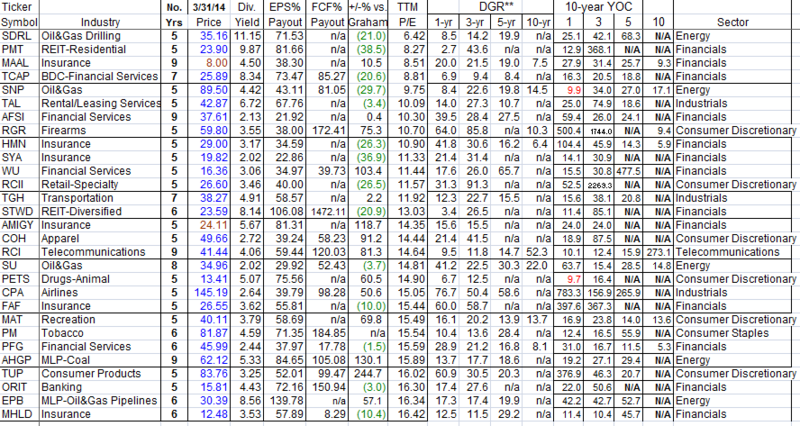 Next I sorted all columns by TTM P/E and eliminated every stock with a TTM P/E over 18. 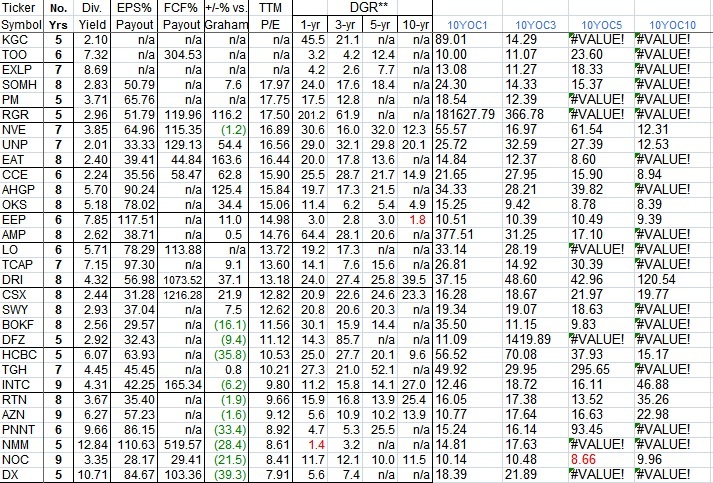 Then I decided to take the latest CCC sheet and add some new columns to calculate a 10-year YOC using each stock’s 1,3, 5 and 10-year compound annual growth rate (CAGR). I will call these new metrics 10YOC1, 10YOC3, 10YOC5, and 10YOC10 for simplicity. 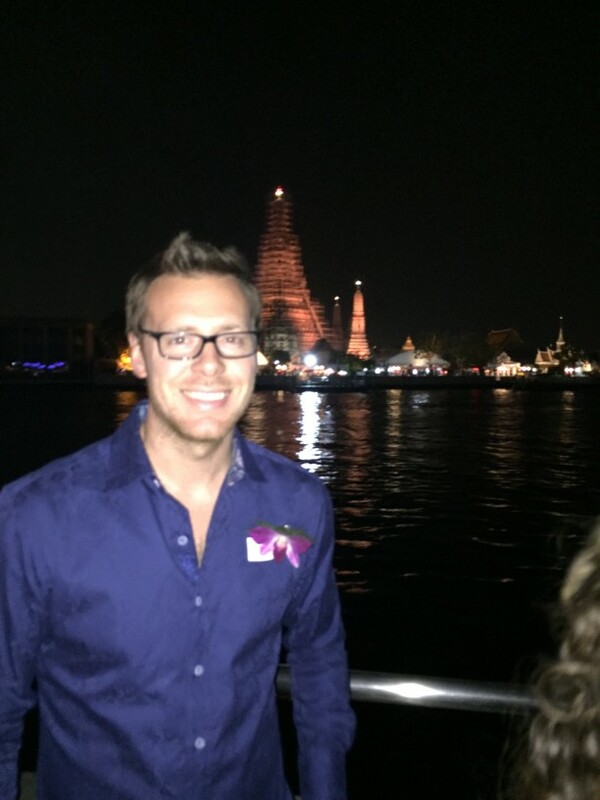 I looked for any companies that had a 10YOC1, 10YOC3, 10YOC5 or 10YOC10 of 10% or higher. I applied this to the list of Champions, Contenders and Challengers. After applying this rule the lists dropped to 8, 41, and 38 companies respectively. This elimination dropped the list sizes for the Champions, Contenders and Challengers to 8, 21 and 29 respectively. This compares to last months list sizes of 8, 16 and 23. Here are the 58 candidates left that may be worthy to do further research on. At a quick glance it seems that a lot of the companies are the same as last month which is expected. However there have been some additions and removals. This is mainly due to a price correction which increases a stock’s starting yield. The additions to the Champions list were AFL and BDX. The companies removed were WAG and VFC. Some companies like Safeway (SWY) and Reynold’s American (RAI) ran up in price and are now off the list while companies like John Deere (DE) and Raytheon (RTN) have now made the cut.